Spoilers for Stranger Things ahead. One of the rare surprises in a summer filled with duds came in the form of Netflix’s Stranger Things. The nearly-perfect recreation of a 1980s’ kid-horror-suspense film brought Gen-Xers back to their own childhoods, and introduced Millennials to the days when a ten-year-old could roam the streets after dark and not be seen for hours without an amber alert being called. It’s arguably the most accurate homage to the ’80s yet, after watching several previous attempts fail. In fact, I’d argue that it’s so slavishly devoted to recreating the feel of movies like E.T. and The Goonies that it suffers from many of the same flaws those films did. One of those flaws, I have to tell you, is Barb. Barb was intended as a throwaway, a way to get popular-girl (and Mia Sara lookalike) Nancy into the intrigue. She is part of a long and storied history of best friends and sidekicks who die early in suspense films of the day, and I’m sure she was intended to be forgotten. After all, she disappears before the real action even starts, and never even has any contact with our main protagonists, the D&D playing boys who would never have allowed a girl in their sanctum sanctorum. Yet, Barb stuck around in our heads longer than she stuck around on the show. There was something about those big, round glasses and preppy collar that was so endearing, that made her wise beyond her years. If Barb had lived, by 2016 she’d probably be patiently abiding her millennial children, waiting for them to move out but still giving them unconditional love. Barb’s a sacrificer. Jake Buckler tells us that there WILL be a season two, and there’s this article from a few weeks ago on io9 talking about it. 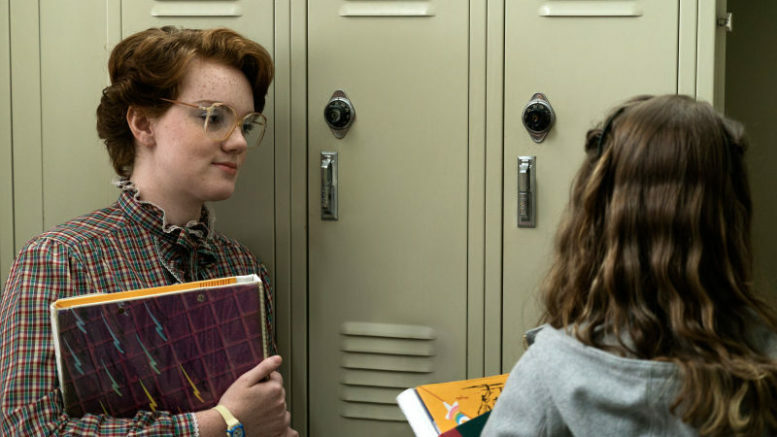 The show’s creators promise “justice for Barb” and I’m presuming that means that at some level they’ll deal with the fact that Barb’s gone beyond another maudlin school assembly. The girl presumably has parents and family and she doesn’t seem like the kind of girl to run off. Parents were far less protective in the 1980s but that doesn’t mean they would just give up. Isn’t that actually just the whole point of season one? This may mean that the truth of the events of season one may need to come out, although that’s unlikely. More likely we’ll see some sort of resolution even if that means fake letters from another location or some other sort of subterfuge. But no matter what there must be some sort of consequence, if season two is to be any good. They’ve already played all the familiar strains of kid-suspense-scifi, maybe they can move into a more mature parent-lost-kid drama instead. Clearly the show’s creators have an excellent insight into the cinema of the late 20th century, why limit it to one genre?